Herbalicious features a cupcake flavor each month. ​Here are some you may have missed! Available by special order - by dozen only. This month we're bringing back a favorite, Raspberry Dream. ​through February. Stop in or call and place an order. May is here so it's time for a NEW cupcake flavor! Who doesn't like margaritas?? We've created a Strawberry Margarita cupcake minus the tequila. 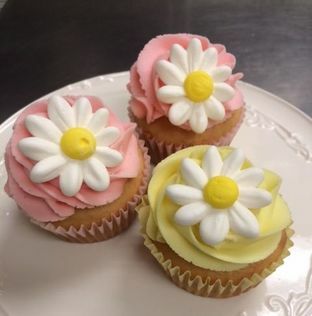 All you Moms looking for a special treat for Mother's Day, tell your kids to bring Herbalicious Strawberry Margarita Cupcakes when they stop by with your hanging basket. They're delish and you can even share them with the little ones. It's a strawberry margarita flavored cake and creamy buttercream, filled with our dream filling kicked up a notch with lime zest! These would be amazing for that Cinco De Mayo party too!! 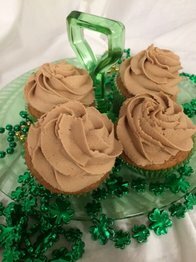 It's a moist Irish Cream flavored cupcake, filled with our delicious mocha cream filling and topped with Irish buttercream frosting! Looking for something sweet for your sweetheart? Look no further! February's Cupcake of the Month is the perfect treat for any lover this Valentine's Day. A smooth, decadent chocolate frosting tops the gluten-free, dark cherry cupcake and contains a dark cherry cream filling at the heart. Pick up a dozen to show your love or spoil yourself and get one of these luscious treats just for YOU! Like the branches of the barren trees on a cold winter's morning after the snow, this cupcake has been iced with a beautifully-delicious, white coconut frosting and flurries of coconut flakes grace the top. The light and fluffy cake underneath is a coconut cake, that is baked fresh in-store and 100% Gluten-Free! January's flavor is like the joy of a snow day captured in the form of a cupcake and we guarantee your taste buds will be just as excited! For the month of December we have a double duo of festive-favorites! Our annual red velvet cupcake is all dressed up for Christmas and topped with a whipped, cream cheese frosting and bright red pearls. Then we have our new cranberry cupcake loaded with real crabberries and decorated with a delicious french vanilla frosting! Try one or try both this holiday season!